With topics ranging from "Manifestations of Trauma and Madness in Mary Shelly’s Frankenstein" to "George Orwell vs. the Roman Catholic Party," eight graduating Middle Georgia State University seniors finishing up their bachelor's degrees in English made their capstone presentations on May 3. Dr. Chip Rogers teaches the capstone course on the Macon Campus. Two other graduating English majors, Hope Fuqua and Samantha Morgan, recently made a bit of University history when they became the first students to complete all of the coursework required for the Bachelor of Arts in English on the Cochran Campus. 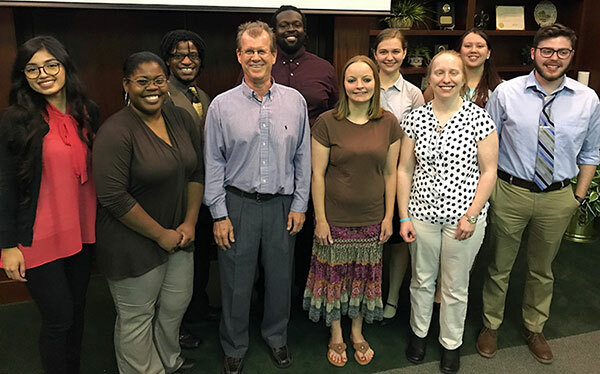 The Macon Campus 2017 capstone class participated in MGA’s pilot program for Georgia’s LEAP States Initiative, part of the national LEAP Challenge (Liberal Education and America’s Promise). Dr. Debra Matthews, associate dean for Undergraduate Studies, leads MGA’s LEAP Initiative and managed the pilot program this spring. Rachel Maddox, "Flawed and Formidable: Galadriel and Tolkien’s Inadvertent Feminism." Sean McGraw, "'Christ, I’m Just a Boy': The Subversion of Masculinity in The Things They Carried." Kaitlyn Rowe, "Manifestations of Trauma and Madness in Mary Shelly’s Frankenstein." Darnesha Sherrod, "Lost in Translation: The “Apundance” of Wordplay in Chaucer’s The Canterbury Tales." Tiffany Barragan, "Lala’s Battle with Sus Tres Identidades: Triple-Consciousness in Caramelo as an Extension of Du Boisian Double-Consciousness." Jeff Bryant, "George Orwell vs. the Roman Catholic Party." Mea Andrews, "The Universality of Vladimir Propp’s The Morphology of the Folktale." Christina McDaniel, "The Conflict between Socialized Power and Personalized Power in King Richard II, Henry IV, Part I, and Henry V."
Kowacie Reeves, "Breath, Eyes, Memory: A Feminist Perspective on Haiti’s Oppression of Women."